I am working on a kiosk build using Ubuntu 9.10. I will post the iso shortly. When installing the fckeditor module in Drupal on some host configurations, probably centos and Apache, this error may occur when browsing for files. The server didn't reply with a proper XML data. Please check your configuration. The big thing about the Web isn't the technology, it's that it's the first-ever platform without a vendor (credit for first pointing this out goes to Dave Winer). From that follows almost everything that matters, and it matters a lot now, to a huge number of people. It's the only kind of platform I want to help build. Apple apparently thinks you can have the benefits of the Internet while at the same time controlling what programs can be run and what parts of the stack can be accessed and what developers can say to each other. I think they’re wrong and see this job as a chance to help prove it. The tragedy is that Apple builds some great open platforms; I’ve been a happy buyer of their computing systems for some years now and, despite my current irritation, will probably go on using them. We noticed shortly after moving in that the house was very drafty. We had the windows replaced, and I did my best to seal a crooked front door. We even replaced the skylights, but nothing we did alleviated these sometimes very cold drafts. 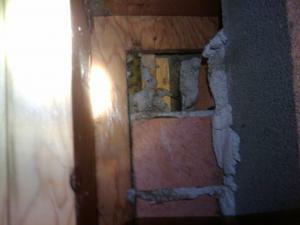 The home inspector noted that the insulation had dropped from the floor onto the floor of the crawlspace. This was due to the use of metal rods, or "tiger's teeth," which are no longer acceptable according to Washington State building code. Am I supposed to see carpet from here? In my continuing efforts to re-insulate my crawl space, I was prepping a previously uninsulated portion of the ceiling beneath the fireplace in our living room. I looked up and saw this. Read more about Am I supposed to see carpet from here? Google has announced it's intent to build a number of high speed networks in the United States. And by high speed, they mean 100 times faster than what is available today. Google's vision is to have a nation-wide network of one gigabit fiber to the home connections with a choice of service providers. Google says it's "goal is to experiment with new ways to help make Internet access better, and faster for everyone." If it creates competition for Comcast and to a lesser extent Verizon, I'm all for it. Weta Digital, co-founded by Peter Jackson, is a digital visual effects company that worked on the flora and fauna of Pandora in the wildly popular movie Avatar. Jordanopensource.org is reporting Ubuntu Linux is the core OS that runs on their massive 4,000 server, 40,000 CPU farm, one of the most powerful in the world. Imagine the cost savings on licensing alone. While Novell supports Linux, it mostly supports SuSE, which uses rpm and not deb packages. But it's still fairly easy to install the Groupwise client on an Ubuntu based system. First, you'll need some software to do this. "Today is the birthday of Linus. Just under 19 years ago, on the first day the shops in Helsinki were open after the holidays, Linus rushed out and spent all his Christmas and birthday money on his first PC: a DX33 80386, with 4 Megs of RAM, no co-processor, and a 40 Megabyte hard disc. Today, the kernel he wrote on that system powers 90% of the fastest supercomputers, and is starting to find its way into more and more smartphones — not to mention everything in between. What would the world look like had he spent his money on something else?" Read more about Happy birthday Linus!